Product recommendations aren’t always easy to come by. Whether you’re looking for a product, or have your product reviewed, recommendations are fragmented at best. But a recent development from seniors at MIT, Tipflare, looks to make the experience much simpler overall for the user base. Tipflare, just getting started, is set to bring a simplified experience to the users, by bringing all the reviews they could want in one place. While there’s no shortage of reviews out there, not to mention news sources, it’s left users jumping from site to site as they try to find advance word on the things they’re looking to pick up. Using Tipflare, however, makes the concept much simpler overall. Basically, users go to Tipflare, and input the particular titles, products, and places that they like, and receive recommendations accordingly. 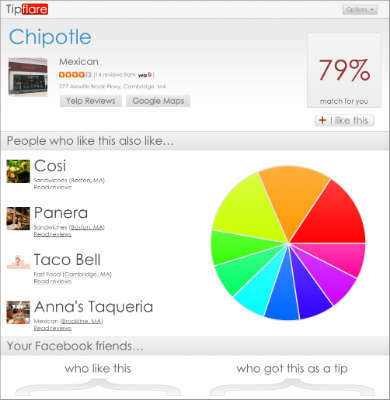 Users can also import their likes from Facebook and get recommendations that way as well, and Tipflare will even make its recommendations based on the day of the week, the time of day, and even manage to bring out a subclass of recommendations, the “new for you” section that ensures there will usually be something new for you to consider whenever you come back. This in turn ensures that you’ll have reason to come back. Naturally, Tipflare’s still just getting started. The concept of algorithms in recommendations is a little shaky yet, and places like Google have addressed this by using friendsourcing and social authentication as alternate tools. Still though, Tipflare is a fine start that’s going to give users a lot of extra utility. This in turn provides a clear impetus for small businesses. One, for those small businesses looking to acquire new items–office equipment, production equipment, and so on–Tipflare will, eventually, make that process much simpler by consolidating the review process and make it much easier to move along the process. Two, for those small businesses whose business depends on reviews–retailers, restaurants and the like–a review process that’s easier for users means they’re more likely to find the reviews of that particular business. This in turn gives businesses an opportunity to improve their own position, and in turn, boost their sales potential. It’s not just quality reviews that drive a small business, though, and the addition of cloud-based telephony tools like local numbers and toll-free numbers will not only help provide that local connection with far-off customers, but also make it easier for those far-off customers to actually reach your business. Still though, Tipflare will go a long way toward getting those crucial recommendations in the hands of those customers who are as yet undecided or otherwise looking for their next whatever they need. Whether using it to buy things or sell things, Tipflare will likely make it easier. This entry was posted in Phone Apps, Small Business, Virtual Office by Steve. Bookmark the permalink.